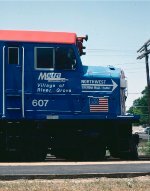 Title: METRA 607 at Western Ave. 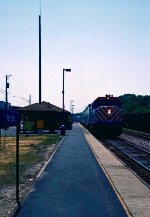 Description: Metra MILW North Line train #2125 rolls past Mayfair Tower. Description: Scoots laying over at the MILW Western Ave. yard. Taken from the rear of Amtrak #7. Description: Train 2113 arrives at the west end of the MILW North Line. Description: After arriving with train 2113, the big F40C waits for it's return trip to the city. Description: Good find here! Old power from Chicago's Metra commuter system. These units worked trains on the old Milwaukee lines west/north of Chicago.